Borla Performance Industries is proud to announce a unique new Cat-Back™ exhaust system for the 2006 3.5L 5-cylinder GM Hummer H3. The grandson of the Hummer is an impressive everyday driver that also seems ready for the outback at a moment’s notice. BORLA RD engineers noted this SUV could use some improvement in torque, so the system they created manages 137cfm more flow with a solid power band increase in the midrange, better known as the area under the curve. 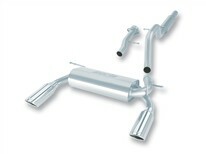 This is just another way that BORLA tailors an exhaust system to fit the needs of the vehicle. This BORLA system (PN 140166) has a split rear exit with two large 4” angle cut, round rolled tips. The BORLA system is lighter, generates more power than stock while enabling greater fuel mileage on this all-wheel-drive SUV, and delivers enhanced sound quality. BORLA, the original pioneers of aerospace-grade high quality austenitic stainless steel (superior to 409 or aluminized steel) free-flow exhaust utilizes patented award and race winning technology to deliver quality, sound, performance gains and enhanced fuel economy -- all with an easy bolt-on installation and backed by an unsurpassed written Million-Mile Warranty.